Solidago californica is a great plant for the back of the perennial border as it often grows to 5 feet tall. Selected varieties stay somewhat shorter, but are no less prone to sending runners off to invade their neighbors. Solidago californica is also nice for the late season with flowers Summer through Fall. The California Goldenrod attracts butterflies including the blues, hairstreaks, skippers, Painted Lady, Mournful Duskywing and checkerspots. There is a hairstreak buried in the middle of the flowers on this California Goldenrod. Solidago californica does well growing on East exposures often in clay soils. Solidago californica does great near the coast but will probably need additional irrigation for inland gardens. Solidago californica looks best following a severe Winter trimming to promote new frest growth each season. Solidago californica is native to most of California living in grasslands and in disturbed areas up to 7500 feet elevation. 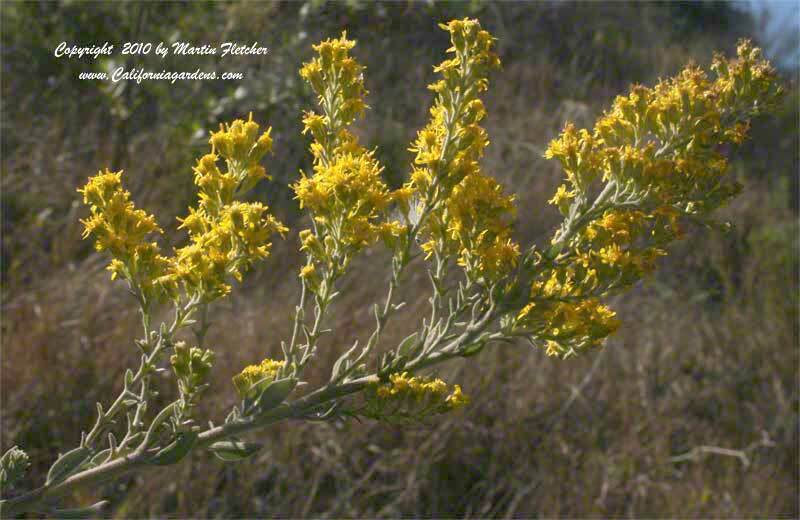 Yellow flowers and grey foliage of Solidago californica - California Goldenrod. High resolution photos are part of our garden image collection.